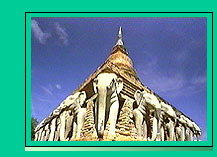 Thailand is an extremely attractive tourist destination. From the capital, Bangkok, with its vast cultural attractions, to exotic beaches, islands and national parks, the country presents tourists with a wide variety of travel experiences. For the most part, Thailand is relatively inexpensive, offering many amenities, including excellent food and affordable, quality lodging. Finally, the Thai people have a reputation for friendliness and hospitality that should appeal to every traveler. Bangkok's international airport (BKK) is the primary entry route for all international visitors, and is serviced directly and indirectly by many major air carriers. From the United States, travelers can expect to spend a day or longer flying to Thailand. The U.S. embassy in Thailand is located at 120/22 Wireless Road, Bangkok (tel. 66-2-205-4000). There is a consulate at Chiang Mai, Vidhyanond Road (tel. 66-2-252-629/30-33). With its eight million inhabitants, Bangkok is a teeming metropolis, but it's nothing like what you'll find here in the States. New buildings can be found around the corner from old Buddhist temples. Everything about the city bespeaks the exotic, especially the food, which you'll want to indulge in. Be sure not to miss the Grand Palace, the temple at Wat Po, and if you can manage it, take in an evening of dinner and Thai dancing. As Thailand most visited seaside resort, Pattaya offers all the amenities one might desire, from first-rate lodging and restaurants (there are plenty of budget places, too) to an assortment of activities (windsurfing, parasailing, water skiing, snorkeling). What's more, Pattaya is less than 100 miles from Bangkok, which makes it a particularly convenient next stop. Thailand's largest island is renowned for its beaches, which vary in quality, so be sure to research your destination shore ahead of time. 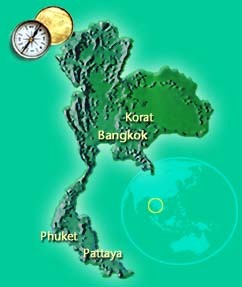 Patong is the most famous, but others include Karon and Kata. And if you're looking for other watery splendors, the island has two stunning waterfalls, Tong Sai and Bang Pae, that you should be sure not to overlook (but to look over, as the case may be). 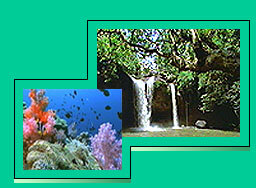 One can get to Phuket via plane from Bangkok, or boat from a number of places. If you're hoping to see an example of Khmer culture, look no further than Korat. Within 80 miles of the northern city, one has access to several amazing examples of 12th century Khmer buildings. Nearby Phimai, a Khmer complex constructed on an artificial river islet, features stunning Khmer artistry in its sanctuary tower and surrounding buildings. Prasat Phanom Rung, east of Korat, harbors a number of Khmer structures as well. Thailand's population is relatively homogeneous. More than 85 percent speak a dialect of Thai and share a common culture. This core population includes the central Thai (36 percent of the population), Thai-Lao (32 percent), northern Thai (8 percent), and southern Thai (8 percent). Area: 198,114 sq. mi. ; about the size of Texas. Capital: Bangkok (pop. 9 million est.). Terrain: Densely populated central plain; northeastern plateau; mountain range in the west; southern isthmus joins the landmass with Malaysia. Religions: Buddhist 95 percent, Muslim four percent, Christian, Hindu, other. Languages: Thai (official language); English is the second language of the elite; regional dialects. The largest minorities are the Chinese (about 12 percent of the population) and the Malay-speaking Muslims of the south (3 percent). Other groups include the Khmer, the Mon (who are substantially assimilated with the Thai), and the Vietnamese. Smaller, predominantly mountain-dwelling tribes, such as the Hmong, Karen, and Mein, number about 500,000. The population is mostly rural, concentrated in the rice-growing areas of the central, northeastern, and northern regions. However, as Thailand continues to industrialize, its urban population (18 percent of total population, principally in the Bangkok area), is growing. Thailand's highly successful government-sponsored family planning program has resulted in a dramatic decline in population growth from 3.1 percent in 1960 to around 1.1 percent today. Life expectancy has also risen -- a positive reflection of Thailand's efforts at public health education. However, the AIDS epidemic has had a major impact on the Thai population. Thai Government officials estimate that Thailand has between 200,000 and 400,000 HIV carriers. Chiang Rai Province in the north may have an infection rate as high as 15 percent. In recent years, the Thai Government has devoted substantial resources toward AIDS education and awareness. Universal, free public education is compulsory for a period of nine years. Education accounts for 16 percent of total government expenditures. Current figures indicate that 93 percent of the adult population is literate. Theravada Buddhism is the official religion of Thailand and is the religion of more than 90 percent of its people. The government permits religious diversity, and other major religions are represented. Spirit worship and animism are widely practiced.